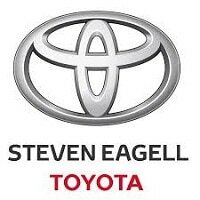 Steven Eagell is an award-winning car dealer group that specialises in selling new and used Toyota cars and vans. It has a total of 18 sites situated across southerly England in towns and cities such as Cambridge, Luton, Milton Keynes, Watford, Peterborough, Romford and Bedford. The company offers a range of other services other than vehicle sales, like MOTs, servicing and repairs and the sale of Toyota parts and accessories. Flexible finance options are available to help with the cost of a new vehicle. Steven Eagell dealerships also run sell your car, vehicle valuation and part-exchange services. On top of that, a Motability scheme is on offer to help disabled drivers purchase a car. The Steven Eagell brand was established in Milton Keynes in 2002. Today, it is one of the largest Toyota dealers in the UK, with branches throughout southern England. It has over 1,500 new and used Toyota vehicles in stock, and employs manufacturer-trained technicians to help get the job done in a professional and thorough manner. In 2016, Steven Eagell won the Best Retailer in Town award at the annual Toyota BRIT awards. There is a wide range of Toyota cars and vans available to buy at Steven Eagell dealerships. Take your pick from a variety of sport, SUV, and compact models, alongside numerous other body styles. Popular Toyota vehicles on show include the Yaris, Auris, and the Verso, amongst various other renowned cars and vans made by the Japanese marque. Aside from Toyotas, Steven Eagell sells a selection of other used vehicles from the likes of Audi, BMW, Citroen, Fiat Ford and Nissan, as well as stock from other top brands.